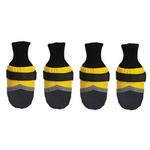 Keep paws safe and covered with our Guardian Gear Dog Boots in Yellow. Bold colors and a non-skid sole. Made from breathable, water-repellent fabric. Stretchy knit cuffs for comfort and touch fastener® closures for easy, secure fit. Reflective strip provides better visibility. Best for indoor or light outdoor use. 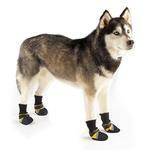 Protect your dog's paws from the elements with these light-use dog boots. 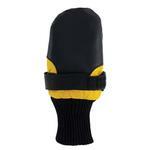 Our Guardian Gear Dog Boots in Yellow are sporty, stylish and helpful for dogs. For dogs needing protection from sidewalk chemicals and from the ice balls that can form between the pads, these boots can be a simple solution for quick jaunts outdoors. Their non-slip soles provide extra security on slippery surfaces. These dog boots feature reflective elements to improve visibility in low-light conditions. The water-resistant materials are soft and pliable and easy to put on. They are secured around the ankle with touch fastener straps. The ribbed cuffs can be worn up or down, depending on your dog's needs. These yellow dog booties are an excellent choice for dogs needing non-slip support due to hip and joint issues on slick floors. They can also be used for dogs with grass allergies and for dogs that won't stop licking and chewing their paws. Not only can these dog boots protect your dog's paws, they are also helpful to protect wood floors from becoming scratched. 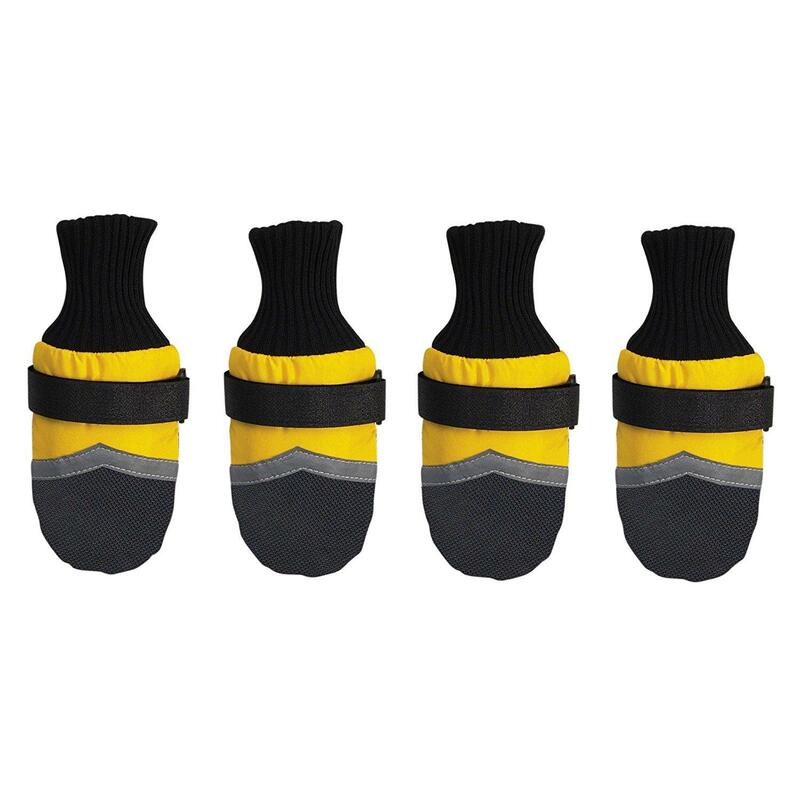 Set of 4 yellow and black dog boots. Made of 100% polyester. Not suitable for rough terrain. Available in more colors. Guardian Gear Dog Boots - Yellow Customer Photos - Send us your photo! This is Taney, wearing the Guardian Gear Fleece Lined Dog Boots to help protect his hind nails since they're a bit weak and can crack. My husband, Thomas, is 6 feet tall, to give a better idea of Taney's size. Posted On 02/06/17 by sarah f from , MA Yes, sarah f recommends this product! Seem well made, they were a little large, my fault for not measuring. Posted On 11/14/16 by Martha Malarkey from Stamford, CT Yes, Martha Malarkey recommends this product! Beside the dog walking funny, these are great. They serve the purpose and are entertaining for humans! ? Posted On 09/11/16 by ANA M from Norcross, GA Yes, ANA M recommends this product! The boots are too big for Rocky, I am going to return this item because Rocky doesn't like them. For me, they are beautiful. Posted On 09/10/16 by Raquel C from New York, NY Yes, Raquel C recommends this product! I have these in other colors. They stay on, protect him from the elements. 1000 thumbs up. Ankle Hugging Band AND Velco! Posted On 03/14/15 by Ann M from , CO Yes, Ann M recommends this product! I bought these for my Husky that had procedures (growth removal) done on her front paws. My instructions were to keep her feet covered and dry. Anyone who has tried it will tell you that keeping things on a dog's paws when they don't want them there is next to impossible. So far, these booties coupled with baby socks, have done the trick! Posted On 02/06/15 by Sheila W from Columbus, OH Yes, Sheila W recommends this product! Posted On 01/04/15 by Phyllis K from Fredericksburg, VA Yes, Phyllis K recommends this product! The dog boots are well-made and looked as if they would hold up for countless walks. However, they were way too big, which most likely was my fault for measuring incorrectly. I ordered a different size. Posted On 11/22/14 by Laura B from , NE Yes, Laura B recommends this product! I got these booties for my cavalier. They were inexpensive and good quality. I would recommend these! Posted On 10/13/14 by Diana D from Albuqueque, NM Yes, Diana D recommends this product! Posted On 10/09/14 by Darlene D from , GA Yes, Darlene D recommends this product! Keeps my cocker spaniel, Josie Claire, feet dry! Fun site, easy to order and great selection. I have ordered from this site many times and never been disappointed.